With sincerity and hard work of our professionals, we have carved a niche for ourselves in this domain by providing premium quality gamut of Electric Pedestal Fan. - Throws air upto 50 feet in all directions from the centre of the fan. - Covers and circulates air in 7800 square feet of area. - Available in 8, 12, 16 feet diameters and have 4 Blades. We are a leading manufacturer of Electric Floor Fans. 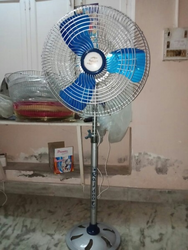 M. L. Saini Electric Co.
We are instrumental in offering all types of electric fans that include wall fans, pedestal fans and table fans. These fans are available in various designs and can also be customized by our vendors as per the requirements of our clients. This entire range provides ideal solutions for maximizing the use of indoor and out door areas and is specially designed for ALMONARD.